“If you don’t know where your meat comes from, then you probably don’t want to know where your meat comes from”. A beautiful fall type day and time for something great cooked low and slow on the Primo grill. Freezer diving produced a lovely brisket… so it begins. I immediately opened Adam Perry Lang’s BBQ 25 now that I always have most of the ingredients that he calls for in his recipes plus always containers of one of his BBQ sauces top shelf in the freezer. A relatively brief thawing out and then a dose of the beef base seasoning, covered and let rest until grilling time. Armed with the key words of the day seasoned, slathering, and smoking I dedicated part of the morning to prep work and getting the fire ready with the thought that I would get the brisket on by 12:30. I was pretty much on schedule and by 12:45 the seasoned brisket was on and cooking at a low temperature of 325° I kept the temperature in that range adding a bit more charcoal just before the second phase of smoking. Maintaining the temperature is easy on the Primo grill once you get the hang of the process. 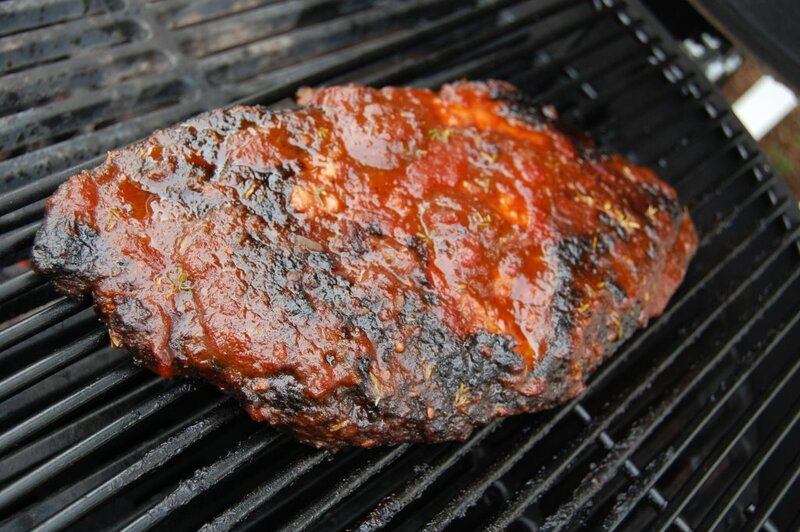 This recipe becomes a go-to recipe; the aromas of the pecan, apple, and cherry woods just seal the deal and the only change I made was to add some of the seasoning spice blend to the glaze and wrap. So here I am pecking the words out, my potato salad made, a few deviled eggs ready and small Boules of sourdough ready to be sliced and not actively seeking a vegetable to go with, hmm zucchini just doesn’t seem right, fresh butter beans are all frozen and I think that potatoes and the chopped veggies in the potato salad qualify. The only real thing to decide at this point is red, white, brew or margaritas??? Burnt ends perfect on the brisket! I blended it all and used it in one step rather than two as the recipe suggests. Meat: Score the point end at ¾-inch intervals, making ¼-inch deep cuts, in a crosshatch pattern. Rub the seasoning base into the brisket on all sides. Not necessary to marinate overnight, but I marinated for 4-5 hours. Prepare charcoal (Primo) grill for indirect grilling maintaining a 325° temperature, prepare wood chip box or foil packet for wood chips. Once your grill is at temp, add the smoking chip packet or box and toss some chips on the hot coals, oil the grill grates on the indirect side and place seasoned brisket on the grate, grill for 3 hours. Have ready two thickness of heavy-duty foil to wrap the brisket in after the first cooking time, lay the brisket on the foil fat side down and cover with wrap sauce, seal packet and place (fat side down on the indirect side, grill for 2 hours. Remove brisket packet and rest for 15 minutes. Unwrap the brisket and remove to platter, cover with glaze, turning to coat. Place on indirect side of the grill for an additional 25-30 minutes. Prepare board sauce turning to coat the brisket, Slice to your preferred thickness, serve with a classic potato salad and slices sourdough bread.